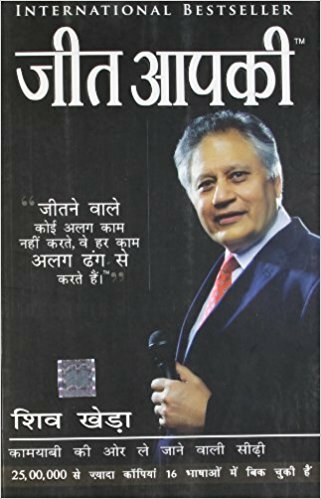 Shiv Khera is a motivational spokesman entrepreneur and successful writer has written a number of books in them, "You Can Win" is an International Bestseller Book. In this book, Shiv Kheda has kept his readers' salon with stories and other ways of knowledge gained from his life experience. Everyone must read this book to build a great life and personality. 1: I am convinced that in the minds of those who have won the victory, the desire will definitely arise, but they never let them dominate. 2: The great violinist Fritz Crisler was playing the violin at a concert. When he stopped playing the violin, a man came to the stage and asked, "I can put my life in order to play the violin like you." Chrysler replied, "I have put it." 3: Make time for you to improve yourself so that you do not have time to criticize others. 4: Winners do not do different things, they do things differently. 5: When I was tired and tired of getting tired, I was curious to know what my opponent would be doing at this time. When I look at thinking he is still practicing then I work harder and when I see he is tired and resting, then I start working harder even more. 1: Mujhe yakeen hai ki jeet haasil karanen vaalon ke man mein bhee taalamatol karanen ki ichchha jaroor paida huee hogee, par unhonne use apanen oopar kabhee haavee hone Nahin diya. 3: apane ko behatar banaanen mein itana vaqt lagaen ki doosaron ki aalochana karanen ke lie samay hee na bache. 4: jeetane vaale alag cheejen nahin karate, vo cheejon ko alag tarah se karate hain. 5: jab main thak jaata aur thak kar ruk jaana chaahata, to mujhe utsukata hotee thee ki mera pratidvandee is samay kya kar raha hoga. jab main soch mein dekhata vah ab bhee praiktis kar raha hai to main aur mehanat karata aur jab main dekhata vah thakakar aaraam kar raha hai to main aur bhee kadee mehanat karane lagata. 6: If people were to know that I had to work harder to achieve this skill, then my work would not be surprising. 7: Should Wilma (the world's fastest runner who could not walk according to doctors) learn? It gives us an education that successful people, despite hardships, achieve success, but not when difficulties are not there. 8: When we do not know our boundaries and limitations, then we wonder ourselves by doing big and high work. Looking back, I wondered if I had any limit. We are bound only by the boundaries that we have made for ourselves. Do not allow education to bind yourself. 9: Practice Discipline: Self-control does not end our happiness, but also enhances it. You must have seen that many people are failing despite talent and ability. They are depressed and this affects their behavior, health, and relationships. They are not satisfied and keep blaming fate for their problems. They do not realize that many of their problems have arisen due to lack of discipline. 10: If you value your honor, then stay in company with virtuous people. It is good to have bad association with you that you live alone. 6: agar logon ko yah pata chal jaata ki is kushalata ko praapt karanen mein mujhe kitanee mehanat karanee padee hai to unhen mera kaam bilakul bhee aashacharyajanak na lagata. 7: vilma ( duniya kee sabase tej dhaavika jo doktars ke mutaabik chal bhee nahin sakatee thee) seekhana chaahie? isase hamen shiksha milatee hai ki kaamayaab log kathanaion ke baavajood saphalata haansil karate hain, na ki tab, jab kathanaion nahin hotee. 8: jab ham apanee hadon aur seemaon ko nahin jaanate, to ham bade aur oonche kaam karake khud ko hee aashcharyachakit kar dete hain. peechhe mud kar dekhane par hairaanee hotee hai ki kya meree koee seema bhee thee. ham sirph unheen seemaon se bandhe hai, jo hamanen apane lie khud banaayeen hai. shiksha ko apane oopar bandhan mat lagaane den. 9: anushaasan ka paalan karen (prachtichai dischiplinai) aatmanushaasan hamaare aanand ko khatm nahin karata, balki aur bhee badhaata hai. aapane dekha hoga ki anek log pratibha aur kshamata ki baavajood naakaamayaab hain. ve maayoos hote hain aur yah baat unake vyavhaar, sehat aur rishton par asar daalatee hai. ve santusht nahin hote aur apanee samasyaon ke lie bhaagy ko dosh dete rahate hain. ve yah mahasoos nahin kar paate ki unakee kaee samasyaen anushaasan kee kamee se paida huee hain. 10: agar aap khud ke maan-sammaan ko mahatv dete hain, to gunavaan logon kee sangati mein rahen. kharaab sangati rahane se to achchha hai ki aap akele hee rahen. 11: Some people repeatedly argue that "I can leave these evils whenever I want." But they do not realize that the bad effects are more powerful than the will. 13: It's good to be defeated by the victory of dishonesty. 14: Iron is made in the fire only after burning in the fire. 11: kuchh log baar-baar ye daleel dete hain ki “main jab chaahoon tab in buraeeyon ko chhod sakata hoon.” par ve ye mahasoos nahin karate ki ichchhaashakti ke mukaabale bure asar jyaada taakatavar hote hain. 13: beeemaanee kee jeet se haar jaana kaheen achchha hai. 14: loha aag mein tapakar hee phaulaad banata hai. 15: There should be equality in kathani and karani. If someone says something and does something, then how will you believe it. 16: There is a tree of bamboo in China that, after planting, after four years of water and fertilization, there is no trace of bud sprouting. But during the fifth year, the bamboo plant grows up to 90 feet in just six weeks. The question arises, did this bamboo plant grow in just six weeks or five years? When there were no signs of growing in it, if it was not given water and fertilizer at that time, would that increase? no, at all. 17: It is so enough for the realization of evil that good people do nothing, and the evil will catch the root. 19: Repeating mistake is the biggest mistake. 20: The debate is something that cannot be won, if we win, will lose even then and if we lose then we will lose. 21: Completely skillful and intelligent means - Do not get entangled in small things and debates. 22: Commitment means that the promise will be played in every situation, whatever it may be. 23: Forgive someone, but do not forget his name. 24: When someone should be embarrassed, when someone takes grief in the heart, when a great thing is made small, when the weakness of someone becomes the cause of the loss, when there is a need to complain to make something fun, when A child should be cryed and when everybody does not get involved, then he is a poor joke. 25: The secret of successful people is that they get used to doing those things which the unsuccessful people do not want to do. 26: When a person repeats a belief repeatedly, it sits in the depths of his subconscious mind, and takes the form of a reality. The repeated repeated lies are believed to be true. 27: People who fail to do something, are better than millions of people, who succeed without doing anything. 28: The world's best and most beautiful things can neither be seen nor touched. They should be felt by the heart. 29: I would like to be unsuccessful in that work, but it will be successful in the end, rather than succeeding in the work which will eventually fail. 30: Most people get what they are looking for. 31: Irregular hard work is better than a regular routine effort, which comes from discipline. 32: The hard work I get, the closer I get to luck. 33: Whatever a person thinks about himself, his destiny is fixed, or his destiny is indicated. " 35: If every discipline is followed in every home, the crimes committed by youth will be reduced by up to 95 percent. 15: kathanee aur karanee mein samaanata honee chaahie. agar koee kahata kuchh hai, aur karata kuchh hai, to aap usaka kaise yakeen karenge. 16: cheen mein baans ka ek aisa ped hota hai jise ropane ke baad chaar saal tak paanee aur khaad dene ke baavajood usamen ankur phootane ka koee nishaan bhee nahin dikhata. lekin paanchave saal ke dauraan baans ka paudha sirph chhah saptaah mein 90 feet tak badh jaata hai. savaal yah uthata hai baans ka yah paudha sirph chhah saptaah mein badha ya is kaam mein paanch saal lage? jab usamen badhane vaale koee lakshan nahin aa rahe the, yadi us samay is paudhe ko paanee aur khaad nahin dee jaatee, to kya vah badh paata? bilakul nahin. 17: buraee ke jad zamaane ke lie itana kaaphee hai ki achchhe log kuchh na karen, aur buraee jad pakad legee. 18: vyavhaar mein chatur hone ka matalab hai hai ham apanen shabdon ka chunaav samajhadaaree aur hoshiyaaree se karen, aur jaanen ki ham kitanee door tak ja sakate hain. isaka matalab yah jaanana bhee hai ki kya kahana hai aur kya nahin kahana hai? vyavhaar kushalata ki bina pratibha hamesha kaam nahin aa sakatee. 19: galatee ko doharaana sabase badee galatee hai. 20: bahas ek aisee cheej hai jise jeeta nahin ja sakata, agar ham jeetate hain to bhee haarenge aur agar haarate hain to bhee haarenge. 21: poornataya kushalata aur samajhadaaree ka matalab hai – chhotee- chhotee baaton aur bahas mein na ulajhana. 22: vachanabaddhata ka matalab yah hota hai ki vaada har haal mein nibhaaya jaayega, chaahe kuchh bhee ho. 23: kisee ko maaf to kar do, lekin usaka naam mat bhoolo. 24: jab kisee ko sharminda hona pade, jab koee dil mein duhkh lekar jaaye, jab kisee mahaan cheej ko chhota bana diya jaaye, jab kisee kee kamajoree haseen ka kaaran bane, jab kisee cheej ko majedaar banaane ke lie beadabee kee jaroorat pade, jab ek bachche ko rula die jaaye aur jab har koee haseen mein shaamil na ho sake, tab vah ek ghatiya jok hota hai. 25: saphal logon ka raaj yah hai ki ve un kaamon ko karane kee aadat daal leten hain, jo asaphal log karana nahin chaahate. 26: ek vyakti jab kisee vishvaas ko baar-baar doharaata hai, to yah usake avachetan man kee gaharaee mein baith jaata hai, aur ek asaliyat ka roop le leta hai. baar-baar doharaaya gaya jhooth sach maan lie jaata hai. 27: kuchh karane kee koshish karake asaphal ho jaane vaale log un logon se laakh guna behatar hain, jo kuchh kie bina saphal ho jaate hain. 28: duniya kee sabase achchhee aur sabase sundar cheejon ko na to dekha aur na hee chhua hee ja sakata hai. unhen dil se mahasoos kiya jaana chaahie. 29: main us kaam mein asaphal hona pasand karoonga, lo aakhir mein saphal hoga, bajaaye us kaam mein saphal hone ke jo aakhir mein asaphal hoga. 30: adhikatar logon ko vahee milata hai jisakee unhen talaash hotee hai. 31: aniyamit kadee mehanat se kaheen behatar hai niyamit roop se kee gaee thodee see koshish, jo anushaasan se aatee hai. 32: main jitanee kadee mehanat karata hoon, bhaagy qe utane hee kareeb pahunch jaata hoon. 35: har ghar mein agar anushaasan ka paalan kiya jaaye, to yuvaon dvaara kie jaane vaale aparaadhon mein 95 pratishat tak kee kamee aa jaegee. UPSSSC Recruitment 2018 Notification released for Apply 2059 Agriculture Technical Assistant Jobs 2018, Apply Online for UPSSSC Vacancy 2018.